Despite a robust European Swedenborgian legacy of fighting the slave trade as embodied in the visionary work of Carl Bernhard Wadström, American Swedenborgians were not conspicuous anti-slavery voices or workers in Antebellum America. In fact, though contemporary Swedenborgians have shown a tendency to cherry pick and generously interpret that history, a close reading of Swedenborgian discourse in Antebellum America in sermons, pamphlets, articles, and personal correspondence up through the end of the American Civil War in 1865 reveals a church movement that was a little behind the curve. The reasons why are complicated, but they start with the fact that Swedenborg was not a social reformer theologian in a modern sense and did not address specific social issues in his expansive theological corpus. This included the institution of slavery even though it was prominent in the London where he spent altogether some thirteen years working on his spiritual books. The English capital was home for a large number of Blacks in various forms of servitude connected to the slave trade in which England had been so deeply enmeshed. About 10 million slaves were merchandized in eighteenth-century England, and London was by far the busiest port city through which such commerce passed. Placards selling sub-Saharan Africans were common in Swedenborg’s London, and abolitionism against this practice was hotter in Swedenborg’s London than it was anywhere else in Europe. Yet there is no direct line of theological application in his writings to guide devotees on the slavery issue. As a result, Swedenborgians in England, South America, and North America were left to shape a variety of arguments from Swedenborg’s abstract theology; and those derived positions ran the full gamut, due especially to the influence of local context. The anti-slavery Swedenborgian who worked fiercest to create a public Swedenborgian conversation on slavery was none other than George Bush (1796–1859)—great granduncle of George Herbert Bush and great, great granduncle of George Walker Bush, the 41st and 43rd Presidents of the United States, respectively. George I, as he is sometimes dubbed, was a renowned intellectual popular for public lectures; a foremost scholar at New York University on Semitic cultures; and the author of the first book-length American biography of Mohammed, the founding prophet of Islam. The formerly well-connected and influential Presbyterian clergyman created a sensation when he converted to the Swedenborgian Church, and he was by far the most prestigious mainline Christian intellectual of the nineteenth century to become Swedenborgian. 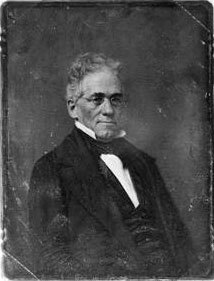 Bush felt by the late 1840s that the general silence in the Swedenborgian Church on slavery could not be excused, and he began correspondence with several Swedenborgians he knew of on both sides of the question. He planned a running dialog to air the issues in the New-Church Repository, a publication he founded and edited. The resulting series—“Aphorisms on Abolition and Slavery”—spanned 1852 and 1853 and was also re-published in New Church Miscellanies (1855) with additional information regarding its origins. The series represents the only systematic Swedenborgian conversation on the slavery question in Antebellum America. The Aphorisms series elicited a number of energetic responses—both pro and con. Taking the form of a running dialog with viewpoints that are never precisely quoted and in which the identities of his correspondents are never revealed, Bush functions as moderator. He does not play a neutral role, as his anti-slavery views are obvious and he editorializes liberally; but he does take special pains to be fair and to keep the conversation going. Some readers were enthralled to have the subject raised, such as a farmer in the West Indies and an abolitionist in the North, neither of whom had joined the Swedenborgian Church—though they adhered to its theology—due to its silence on the slavery question. Others were horrified that the difficult subject was being broached at all, feeling that it was not appropriate to air it out in public discourse. Bush lost many subscribers due to the series, though he claims in the 1855 republication that most of them came back. The Bush series reveals a spectrum that could be replicated in most American Christian denominations at that time: immediatist abolitionism; gradualist anti-slavery dismantling; colonization (relocating Blacks to a free society somewhere outside the United States); a “temporary” pro-slavery position based on a confidence that a just divine providence was working toward some good end; and a wholesale pro-slavery position based on the perspective that slavery was a useful social institution for the betterment of both races. American Swedenborgians brought some distinctive theological perspectives to the matter. Enlightenment, tolerance, and egalitarianism had appealed in England and France where the self-interest was much further removed from the daily living of a vast majority of Europeans. This set of circumstances made European Swedenborgians ripe for arguments of liberty from Swedenborg’s writings. In the American context, however, where the institution of slavery was a much bigger and more integrated aspect of the social fabric, removal of such a colossal social institution seemed a suspicious diversion from the primary work of heralding the New Jerusalem theological revolution that Swedenborgians believed needed their whole attention. Spiritual abstractions about the Last Judgment, hereditary evil, spiritual freedom, divine providence, and racial theories were used to support a Swedenborgian passivity and postponement of action. Their commitment to divine providence as they understood it in Swedenborg’s thought made most American Swedenborgians confident that matters were firmly under divine control. Their understanding of a fully redeemed world—the heavenly Jerusalem descending to earth through the Last Judgment—required a profound and pervasive theological conversion of the masses. A great many Swedenborgians held no confidence in mere political victories achieved through the current uninformed spiritual theology. After this sustained flurry of intense exchange fostered by the distinguished NYU scholar, the slavery conversation went underground again, nearly vanishing from published dialog among American Swedenborgians until after the Civil War commenced, at which time American Swedenborgianism finally did swing with considerable passion into anti-slavery commitments. Bush did not live to see it. He died in 1859 prematurely from poor health. Yet, 160 years later as his country still wrestles painfully with an ongoing Black Lives Matter movement, the work of the first George Bush still peals forth like a trumpet calling Swedenborgians not only to hear human justice principles aright in Swedenborg’s theology but to apply them socially. Bush, George, ed. New-Church Repository (1852–1853). _____. New Church Miscellanies or, Essays Ecclesiastical, Doctrinal and Ethical. New York: Wm. McGeorge, 1855. DeCharms, Richard. A Discourse On The True Nature Of Freedom And Slavery: Delivered Before The Washington Society Of The New Jerusalem, In View Of The One Hundred And Eighteenth Anniversary Of Washington’s Birth. Philadelphia: J.H. Jones, 1850. Holcombe, William. Suggestions as to the Spiritual Philosophy of African Slavery. New York: Mason Brothers, 1861. _____. “The Alternative: A Separate Nationality, Or The Africanization Of The South.” Southern Literary Messenger (Feb. 1861). Lawrence, James. “The Role of the Churches in the American Abolitionist Controversy,” in The Moment is Now: Carl Bernhard Wadström’s Voice on Human Rights and the Abolition of Slavery, Anders Hallengren, ed. (forthcoming). McKivigan, John R. The War against Proslavery Religion: Abolitionism and the Churches, 1830–1865. Ithaca and London: Cornell University Press, 1984. Odhner, Carl Theophilus. “The Early History of the New Church in Sweden,” New Church Life 31:4 (April 1911): 269–80. Swank, Scott Trego. The Unfettered Conscience: A Study of Sectarianism, Spiritualism, and Social Reform in the New Jerusalem Church, 1840-1870. Doctoral dissertation, University of Pennsylvania, 1970. Williams-Hogan, Jane. “The Swedenborgian Foundations of Wadström’s Plan for a Free Community in Sierra Leone,” in The Moment is Now: Carl Bernhard Wadström’s Voice on Human Rights and the Abolition of Slavery, Anders Hallengren, ed. (forthcoming).